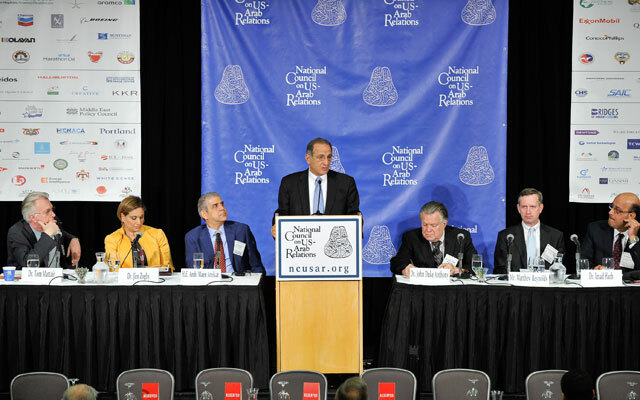 The National Council on U.S.-Arab Relations’ 23rd Annual Arab U.S.-Policymakers Conference included a session on “The Palestinian Future” that featured Dr. Tom Mattair, H.E. Ambassador Maen Areikat, Ms. Karen Koning AbuZayd, Mr. Bill Corcoran, Mr. Matthew Reynolds, and Mr. Yousef Munayyer. Dr. Thomas Mattair – Executive Director, Middle East Policy Council; former Research Scholar, Emirates Center for Strategic Studies and Research; author, The Three Occupied UAE Islands: The Tunbs and Abu Musa and Global Security Watch – Iran: A Reference Handbook. H.E. Ambassador Maen Areikat – Chief Representative of the Palestine Liberation Organization (PLO) to the United States; former Deputy Head and Coordinator-General of the Negotiations Affairs Department of the Palestinian Liberation Organization. Mr. Bill Corcoran – President and CEO of ANERA (American Near East Refugee Aid); former Vice President, Child Fund International. Mr. Chris McGrath – Senior Liaison Officer and Acting Head of the Washington Representative Office, United Nations Relief and Works Agency for Palestine Refugees in the Near East (UNRWA); former Communications Strategist for U.S. Senate Majority Leader Harry Reid. Ms. Alison Weir – President, Council for the National Interest; Executive Director, If Americans Knew. Dr. Sara Roy – Senior Research Scholar, Center for Middle Eastern Studies, Harvard University; Board Member, American Near East Refugee Agency (ANERA) and the Center for American Jewish Studies, Baylor University; author,The Gaza Strip: Political Economy of De-development and Hamas and Civil Society in Gaza: Engaging the Islamist Social Sector. Dr. Tamara Sonn – Wm. R. Kenan Distinguished Professor of Humanities, College of William and Mary; author, Interpreting Islam: Bandali Jawzi’s Islamic Intellectual History, Religions through Law: Judaism and Islam, Islam: A Brief History, and The Religion Toolkit: A Complete Guide to Religious Studies. Mr. Jeff Steinberg – Editor, Executive Intelligence Review. Mr. Mark Perry – Author, Conceived in Liberty, The Last Days of the CIA, and Talking to Terrorists: Why America Must Engage its Enemies. Mr. Yousef Munayyer – Executive Director, Palestine Center and the Jerusalem Fund for Education and Community Development. Ms. Michelle Steinberg – Counterintelligence Editor, Executive Intelligence Review (EIR). Dr. Ghada Karmi – Co-Director, Centre of Palestine Studies, University of Exeter. Dr. Norton Mezvinsky – Distinguished Professor Emeritus, Connecticut State University; President, International Council for Middle East Studies. Ms. Kathleen Christison − former Analyst, Central Intelligence Agency; Author,Perceptions of Palestine: Their Influence on U.S. Middle East Policy; The Wound of Dispossession: Telling the Palestinian Story; and, Palestine in Pieces: Graphic Perspectives on the Israeli Occupation. Ms. Barbara Lubin – Founder and Executive Director, Middle East Children’s Alliance. Chair: Dr. Peter Gubser − Immediate Past President, American Near East Refugee Aid, Inc [ANERA]; Member, Board of Directors, National Council on U.S.-Arab Relations. Speakers: Dr. Nadia Hijab − Senior Fellow at the Washington, D.C.-based Institute for Palestine Studies. Author, Womanpower: The Arab Debate on Women at Work and co-author Citizens Apart: A Portrait of Palestinians in Israel. She was Editor-in-Chief of the London-based Middle East magazine before moving to New York in 1989 to join the United Nations. Since 1999, she has worked as an independent consultant for international organizations on human rights, human development, gender, and the media. Mr. Daniel Levy − Senior Fellow and Director of the Middle East Initiative at the New America Foundation and a Senior Fellow and Director of the Prospects for Peace Initiative at The Century Foundation. Dr. Naseer Aruri − Chancellor Professor (Emeritus) of Political Science, University of Massachusetts Dartmouth; author of numerous books and articles on the Arab-Israeli conflict; President of the Board, Trans-Arab Research Institute; Member, Executive Committee, Center for Policy Analysis on Palestine. Dr. Peter Gubser, Immediate Past President, American Near East Refugee Aid, Inc.
Mr. Daniel Levy, Senior Fellow, New American Foundation, Washington, D.C.
John Duke Anthony – Path to Peace in Mideast Needs More Participants (.pdf file). This article appeared in The Virginian Pilot on June 10, 2002.